Scappoose's Jakobi Kessi placed first at 195 pounds and Cutter Sandstrom pinned his way to the heavyweight title, pacing the Indians to team title at the Dec. 21 Gladstone Invitational wrestling tournament. The Indians put nine boys into the finals, including two at 195 and heavyweight. Scappoose scored 167 1/2 points to runner-up Yamhill-Carlton's 149 1/2. Molalla placed third in the 10-team field with 103 1/2 points. Kessi, a junior, opened with first-round pins over Gladstone's Hassan Ayach and Molalla's Chase Martin, then defeated teammate Brett Krieger 7-6 in the final. At heavyweight, Sandstrom, a sophomore, pinned Jefferson's Maleek Christianson at 1:25 of the first round in his opening match. Sandstrom pinned Astoria's Skylar Smith with 53 seconds remaining in the second round of their semifinal match. 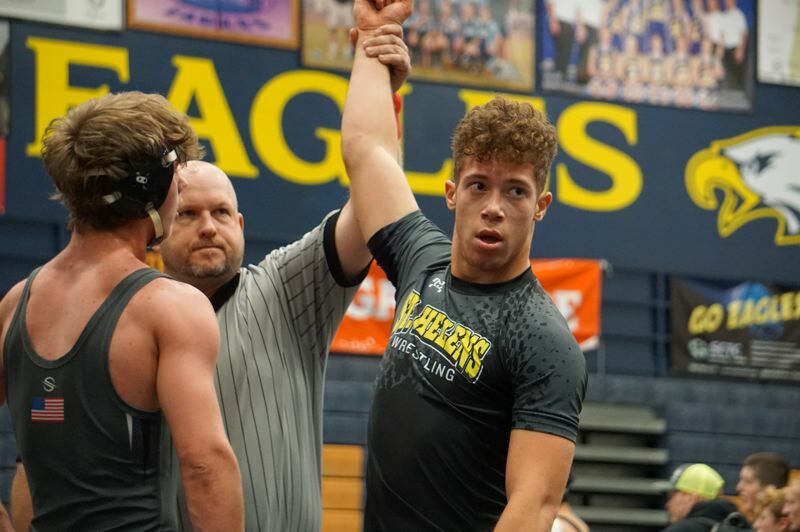 In the final, Sandstrom trailed teammate Jerico Archer 14-5 before turning the tables and putting Archer on his back in the closing seconds of the second round. Scappoose's other finalists were AJ DeGrande at 120, Peyton Healey at 126, Colton Frates at 132, Ashton Kaufmann at 145, and Max Amaro at 160. In the girls' tournament, Scappoose's Bella Amaro pinned two opponents and won by a 19-3 technical fall in her final match to claim the 130/5 weight class. Of the Indians' five other girls, Taylor Johnson placed second at 130, Belle Erhardt finished second at 145, Ruby Gibson was second at 170, Isis Phillips placed second among the heavyweights, and Tess Conway finished third at 105.
n The Gladstone tournament continued the Indians' good performance in a Dec. 19 dual meet with Parkrose. Scappoose beat the Broncos 56-12. Kessi and Sandstrom scored pins at 195 and 285, respectively. DeGrande also won by fall at 120, as did Trevor Jackson at 152 and Quincy Cleveland in 53 seconds at 220. Frates won his 138-pound match by technical fall, 18-3, and Amaro was a 4-1 winner at 160. "Our guys really came out and set the pace for the dual," Scappoose coach Nick Byrd said. "Our JV guys are really coming along and working hard in the room, and that showed. "Jakobi Kessi did a great job setting the (varsity) tone for us, and our big guys wrestled well. It was good to get some guys back in the lineup after missing last week, and they responded pretty well. DeGrande and Frates were able to open up quite a bit and are developing into quality team leaders. I was impressed with Trevor Jackson coming out really physical and dictating the pace of the match. "From top to bottom, we had a lot of fire, which was really good to see." 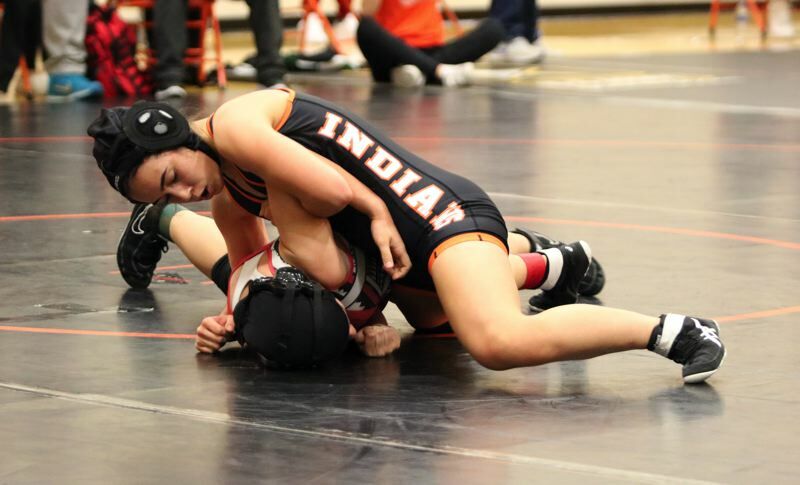 Scappoose will be in action again on Jan. 16, when the Indians visit Wilsonville for a Northwest Oregon Conference dual meet. The St. Helens wrestling team won't compete again until Jan. 10, when the Lions resume Northwest Oregon Conference action with a dual meet at Milwaukie. St. Helens' final outing in December brought the Hillsboro Spartans for a visit on Dec. 19. Hillsboro won 43-31. Highlights for St. Helens included victories in three of the four lowest weight classes and in three of the six highest divisions. Four Lions scored pins: Narcizo Garza got one in 1:12 at 120 pounds, Shawn Lee posted his in 1:56 at 160, Marricle Bask won his 182-pounder by fall in 1:22, and Ben Torres scored his fall at 285 in 3:26. Also winning for St. Helens: Gavin Schaer by 5-1 decision at 106, and Tristin Buchanan by major decision, 9-1, at 126. Torres and Lee each have nine victories this season, with five by pin. Bask and Garza have eight wins apiece; Bask had pinned six opponents, and Garza has won four times by fall. Ryan Burri and Buchanan are next for St. Helens with seven victories each. Burri has scored six of his wins by pin.